Ridding a country of its last few thousand cases of Guinea worm disease presents a special challenge. Those cases exist mostly in remote areas, where there are few wells and people draw their drinking water from ponds sometimes rife with Guinea worm larvae. Ghana and other West African countries dramatically reduced the number of Guinea worm cases in the early 1990s, but progress in Ghana stalled in recent years. The disease is controlled by recruiting a volunteer in each endemic village and then training that person to educate people about prevention, record and treat new cases, and replace household and personal filters for drinking water. Traditionally, the village volunteer has been a man, someone whose advice people will heed. Typically, he performs this duty after working in the fields all day far from home. The best of these volunteers find enough energy to get around their villages at night and attend to Guinea worm control. Completely eliminating the disease requires constant surveillance, so that no one with an emerging Guinea worm releases it into the water supply. And, since no pond can be considered 100 percent safe from the worm larvae, everyone must drink only filtered water lest the cycle of infection and water contamination be repeated endlessly. Ghana boldly stepped up its surveillance this past year by recruiting more than 6,200 women Red Cross volunteers to tend to Guinea worm eradication. Networks of about 10 women per endemic village are swarming over the problem in an effort to smother the disease forever. Involving women is having a major impact in combating Guinea worm disease. Women are the ones who fetch water for the home, filter it, and make sure children don't drink unsafe water-even while swimming or bathing. In charge of many daily family activities, women also get around a village more than men, so they're better able to detect new cases. At the outset of the massive volunteer initiative, Ghana recorded an increase in Guinea worm cases, because the army of women volunteers detected numerous unreported victims. "That's actually a positive development," says Nwando Diallo, resident technical advisor for The Carter Center's health programs in Ghana. "If we don't detect cases, we can't treat and contain them-in other words, keep victims from spreading the disease." Zanib Adam, who supervises 830 women Red Cross volunteers in Ghana's northern region, attests to the initiative's success. It was slow going at first, however, she says, because of the low status of women in Ghana society. "Even other women often disregarded the Red Cross volunteers," Zanib recalls, "until I or other health officials were seen walking with the volunteers in the village. Then they were taken more seriously." One measure of success is the support the volunteers receive from the village chief and elders. These leaders, who once might have resisted giving women such responsibility, seem eager to rid their village of a disease that causes so much suffering and keeps people from working. The chief recruits volunteers and may appoint a coach for them, someone to work closely with the male volunteer. "This system works better," Zanib contends. "When a woman coach leads a meeting, other women are more likely to speak up-to ask questions and report problems. When a man leads a meeting, women are too shy to say anything." Perhaps because of the support they receive, keeping volunteers motivated has not been a problem. "They bike miles after dark to go to Guinea worm meetings," Zanib says. "And when I visit a village, I don't have to go around asking a lot of questions. The volunteers rush to me to talk about the situation." This commitment causes some conflict within families, however. Damou Akou, a 20-year-old volunteer coach, says her husband and brothers sometimes complain about the time she takes from working their farm to take care of Guinea worm responsibilities. While seven months pregnant, Damou would walk several miles three times a week to meet with the women she coaches. Now, even with a baby to care for, she states vehemently, "I don't want to stop doing this work now, not until we get rid of Guinea worm completely." As an indirect consequence of involving women volunteers, their status in Ghana village society could improve. "Women are at the bottom of Ghana society," Nwando Diallo explains. "First come men, then children. These Red Cross volunteers are performing a huge service for their villages and their country. When we visit a village, we make sure everyone knows about the important role they are playing. "I hope that, while we are eradicating Guinea worm, we can elevate the status of women even just a little bit. I've already seen positive change." Women Red Cross volunteers, averaging 10 per endemic village, are having a major impact on combatting Guinea worm disease in Ghana. 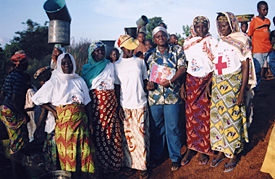 Damou Akou, 20, shown filtering water, is a Red Cross coach in Ghana's northern region. 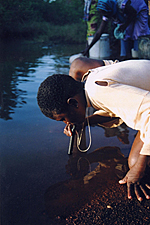 In November 2003, the Guinea Worm Eradication Program began distributing 280,000 pipe filters for Guinea worm endemic areas in northern and eastern Ghana. Pipe filters are individual filtration devices, similar to a straw, which allow people such as cattle herders, hunters, traders, and nomadic farmers to filter their water to avoid contracting Guinea worm while traveling or working in the field. Nwando Diallo (c.), resident technical advisor for The Carter Center's health programs in Ghana,offers support to local volunteers. Fewer than 55,000 reported cases of Guinea worm disease remain worldwide, down from 3.5 million when the Guinea worm eradication campaign began in 1986. Ghana has the second highest number of cases of Guinea worm disease in the world, accounting for 66 percent of all remaining cases outside of Sudan. 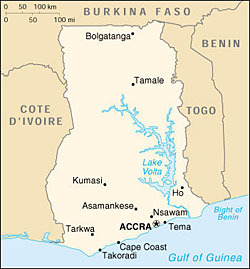 Fifteen of Ghana's 110 districts accounted for 95 percent of the reported Guinea worm cases in 2002: one district in Upper West Region, nine districts in Northern Region, three districts in Volta Region, and two districts in Brong-Ahafo Region.